An engine failure leaves a group of white middle class youths stranded in the worst part of Philadelphia. As a black gang approaches their vehicle, the youths panic and run head over heels into an abandoned building. The door slams shut, a degenerate giant with his giant hammer appears, and heads get splattered. The giant is just the tip of the iceberg; soon the surviving youths find themselves dodging deformed midgets, a man wearing the skin of a woman, and other assorted horrors. The house is a trap, designed to capture prey for the race of creatures that live in the cave system beneath it. And that’s where the youths learn the exit is, so down they go, into the bowels of the earth. The long, meandering dungeon crawl that follows is straight up death metal, early Cannibal Corpse style. The plot gets lost somewhere in the darkness, as do the youths, stumbling along from horror to horror. It’s a constant barrage of gloriously obscene vileness, all mood and atmosphere. The subterranean caverns are another world, and it’s been there for ages; there’s a hint of perverse grandeur to the revelation, reminiscent of Lovecraft‘s The Rats in the Walls. While the youths are preoccupied with the horrors, the gang outside – good people, as it turns out – rallies the neighbourhood to help them. 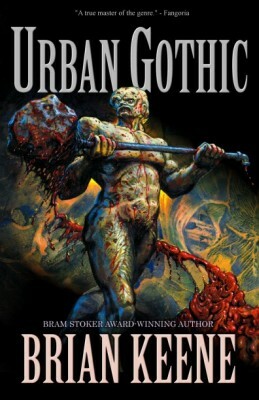 The urban setting is a refreshing change from the usual rural cannibal fare (Laymon, Ketchum, et al), rooting it firmly in the real world and its real problems. In the end it all feels like an introduction to a larger whole, a mere scratch on the surface; but it’s a deep, nasty, wonderfully festering scratch. Originally published in 2009, currently available from Deadite Press. Visit the author’s site!